A way to display good quality text is important in the classrooms. Shared Media/Media-on-a-Prim (MOAP) allows a small number (say 4-6 simultaneously active) feeds from web pages, video, Flash, etc. to be visible on prim surfaces (like screens). This can include dynamic content from Moodle and other content management systems on the web. Note that many feeds from URLs can be set up… but only a few can show at once, the others simply turning off when not in view or when too many are in view. But it is possible to show much more on screen when textures are rendered in world or images are uploaded and shown i world directly from the asset data base. This is is how most presentation screen have workled in Second Life and OpenSim until recently when Shared media/MOAP appeared. The trick is to use BOTH mechanism in a classroom – using uploaded images and displays where possible, but using the small number of MOAP feeds for dynamically delivered shared content. 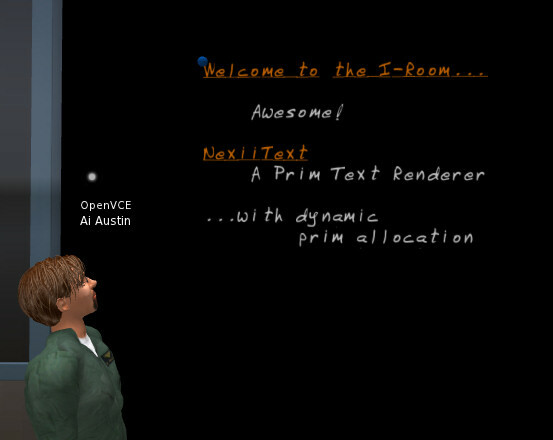 But what if we could show dynamic text content as well using previously uploaded content via fonts in the asset data base, with display of characters from those fonts on prims set up as a display/blackboard.